Last night, along with a longtime friend of the blog, I braved the cold to check out a new restaurant on Rolfe Square in Cranston. I’d seen some posts about it floating around over on Facebook (something about Italian comfort food) this past weekend, but wasn’t quite sure what to expect. Well, gotta say that our meal, the service, and the interior were all truly outstanding and I urge you to get there asap and experience it for yourself. 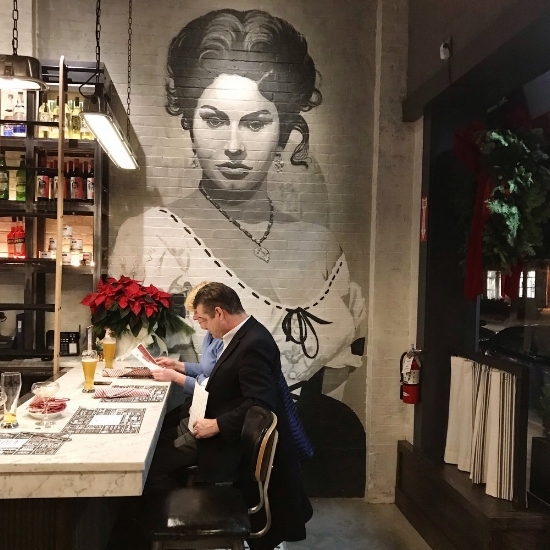 But first, let me dig into a few of the things that dazzled us about Bettola, a new casual Italian restaurant from the people (including Chef Antonio “Tino” Franco) who brought us Basta in Pawtuxet Village. My friend C. was also obsessed with the mural on the other side of their beautiful bar area, essentially a guide to Italian hand gestures. (Cute and funny, a nice conversation starter…) The space is welcoming and warm, and incorporates a lot of features (the two murals for ex.) that you’d expect to find in a big city restaurant, all without taking itself too seriously (Check out the faux ads on the placemats, they’re a real hoot.). Our table was right in the middle of the restaurant, between that fab bar (plenty of room to hang out there with your favorite person) and an impressive looking pizza oven. We also got an eyeful of the mini market area/side counter, directly in front of the oven, where you can pick up oil, a Panettone, and more goodies imported from Italy. Again, another detail you’d expect to find in a Boston or NYC eatery. Think big city decor and attentio to detail meets updated, old world Mediterranean pizza and pasta. Our server who was exceedingly smiley and nice recommended the Marilyn Monroe pizza (a pie made with “Bianco sauce”, ricotta, mozzarella, gorgonzola, hot honey, and crushed pepper…the honey being an unexpected but absolutely delish addition! Another key point, the flour for all of their pizzas also comes from Italia. ), which we ordered along with an arugula salad (I’m working on incorporating more greens into my life going into 2019, how ‘bout you? ), red wine (light and slightly fizzy, for the record we wanted something light….also from Italy, also recommended by our server), and dessert (a nice apple mousse cake that we split that was worth the splurge…another recommendation from our server). And we couldn’t stop raving to one another about how yummy the pizza, wine, and dessert were, long after we’d left the restaurant. So text that friend who lives for amazing pizza and wine or that other friend who’s always talking about their trip to Italy, or maybe just take your SO (That’s Significant Other.). Whatever you do or whomever you take along, for Pete’s sake just get yourself over to Bettola. It’s terrif and there’s really nothing else quite like it in the area! *Bettola is located at 44 Rolfe Square in Cranston.